I have to say that I didn’t know exactly what to think when I first saw Six Shooter. The front cover just shows a gun shooting out dice with the tagline “no waiting for your turn everyone plays at the same time”. Despite the game being made by a publisher, Crystal Tower Games, that I had never heard of; I was intrigued enough to purchase the game. It didn’t hurt that the game was only $1 as I am a sucker for trying out new cheap board games. It turns out that Six Shooter is sort of a hybrid board game. 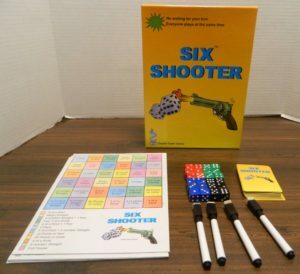 Six Shooter finds a way to combine Yahtzee and Bingo into a dice game that is better than I expected which unfortunately gets repetitive rather quickly. Each player chooses a gameboard. They can choose which side of the gameboard they would like to use. All of the players take six dice of the same color and a dry erase marker. Shuffle the cards and place them face down in the center of the table. Six shooter is played in rounds. All of the players will play at the same time. Each round begins with the top card being flipped over. This card will show a dice combination that all of the players will try to roll. For this round the players will have to roll a four number straight and a pair. All of the players will roll their dice at the same time. Players can roll their dice up to four times. Before each roll the players choose which numbers they would like to keep and which they would like to re-roll. On this first roll the player rolled two sixes and two numbers in a row. They probably want to re-roll one of the threes and one of the sixes. After four rolls all of the players will compare the faces on their dice to the combination they were supposed to roll. If a player is able to successfully roll the combination, they will get to cross off one of the corresponding spaces on their gameboard. This player has met the card’s requirement as they have rolled four numbers in a row and a pair. They will get to cross off one of the “4 number straight + 1 pair” spaces on their gameboard. If the player is able to roll six of a kind, the player may cross off one space of their choice from their gameboard. This player has rolled six of a kind. They can cross off the space of their choice from their gameboard. If the player does not complete the combination, they receive nothing this round. Unlike other dice games there are a couple special rules when trying to meet the combinations on cards. Four dice of the same number can be split into two pair. Five of the same number can be split into a full house. Once everyone has completed the round, a new round is played. The next card is flipped over and players try to complete that combination. If the card deck ever runs out of cards, the cards are shuffled and they form a new draw pile. A player wins the game when they are able to cross off six spaces in a row vertically, horizontally, or diagonally. This player has crossed off six spaces in a row horizontally. They have won the game. If two or more players get six spaces in a row in the same round, the tied players will enter a tie breaker round. Another card is flipped over. All of the tied players try to complete the card within four rolls. If one player completes the combination and the other tied player(s) fail, the player who completed the combo wins the game. If all of the players complete or fail the combination, another card is played until only one of the tied players is able to complete it. This is going to be a little anti-climatic but I can describe Six Shooter quite well in just one sentence. 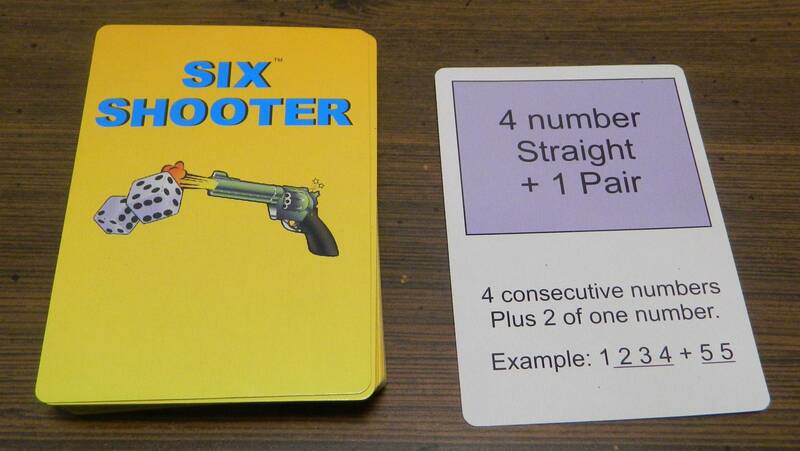 Six Shooter is basically what you would get if you combined Yahtzee with Bingo. 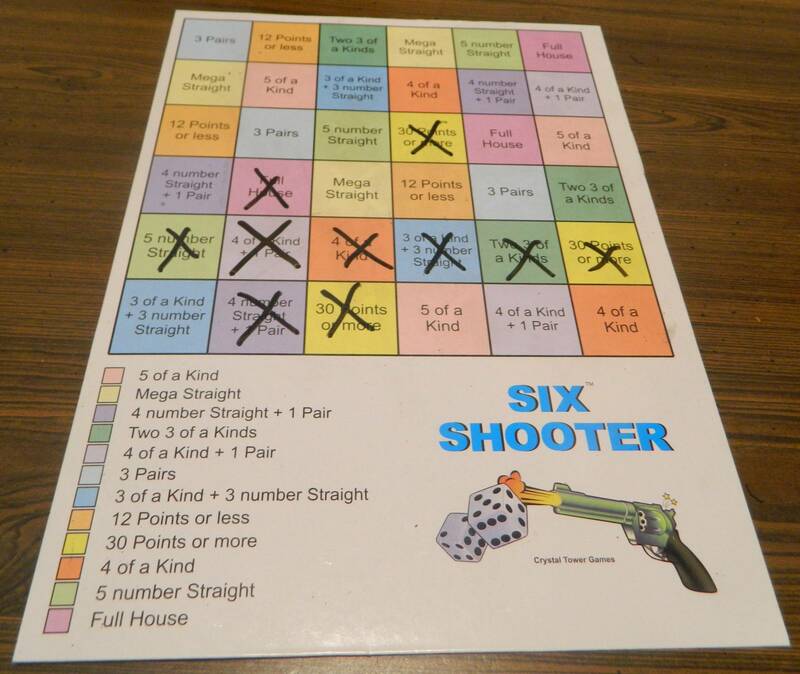 The main gameplay in Six Shooter involves rolling dice and trying to get different dice combinations. In each round you are given a dice combination that you need to roll. You have four rolls to complete the task. The game doesn’t really have any unique combinations so this aspect of the game is like Yahtzee and many other dice rolling games. When you successfully roll a combination you get to cross off one of the spaces from your gameboard. Your ultimate goal is to cross off six spaces in a row. Outside of it being six spaces instead of five, this is exactly what you do in Bingo. As Six Shooter is basically Yahtzee combined with Bingo, you probably already have a good idea of whether you will like the game. The gameplay heavily favors the Yahtzee mechanics as the Bingo mechanics only come into play when you successfully complete one of the challenges. I have to say that I didn’t have high expectations for Six Shooter. I don’t mind Yahtzee but I wouldn’t say that it is one of my favorite games. You could also make an argument that Bingo is not even a game as it relies entirely on luck and your ability to spot a number on your board. The idea of combining these two games sounded like a pretty bad idea. For some reason Six Shooter works better than I was expecting. The game is not great but it is not awful either. There is something about the game’s simplicity though which allows you to get some enjoyment out of the game. It is fun rolling the dice and completing some of the more challenging combinations. Six Shooter is fun in the way that all Yahtzee style games are fun. The game can be fun if you are looking for a game where you can turn off your brain and just have some fun. You can have some fun with Six Shooter but it gets repetitive pretty quickly. As you mostly just roll dice and occasionally cross off spaces on the gameboard, you will get sick of the game after a while. The game also relies on a lot of luck like most dice games. The player who rolls best is going to win the game. There are a few decisions in the game but they are usually very obvious. Basically the only impact your decisions have in the game involve choosing which dice to keep and re-roll and which spaces to cross off when you succeed. The second decision is usually very obvious while there are occasionally a few interesting decisions when choosing which dice to keep. These decisions don’t really impact the game a lot though. One decision made by the designers that deserves a lot of credit is the fact that all of the players play at the same time. This was a good decision for a couple reasons. First all of the players have to go after the same combination. None of the players get an advantage by getting a combination they want while other players get stuck with a combination they don’t want. The biggest reason why I like this decision though is that you don’t have to waste a lot of time waiting around for the other players. The only times you have to wait for other players is when they take longer to roll their dice than it takes you. This makes the game move pretty quickly as you almost always have something to do. Having everyone roll for the same combination introduces some issues for the game though. Being forced to roll a specific combination each round can be kind of restrictive. You could be one space away from winning and then be forced to roll a combination that isn’t going to help you. You can either roll for the combination that isn’t going to really help you or you can try to roll six of a kind to cross off the last space. This can be frustrating as you could end up rolling a more difficult combination than the current combination and not get credit for it. 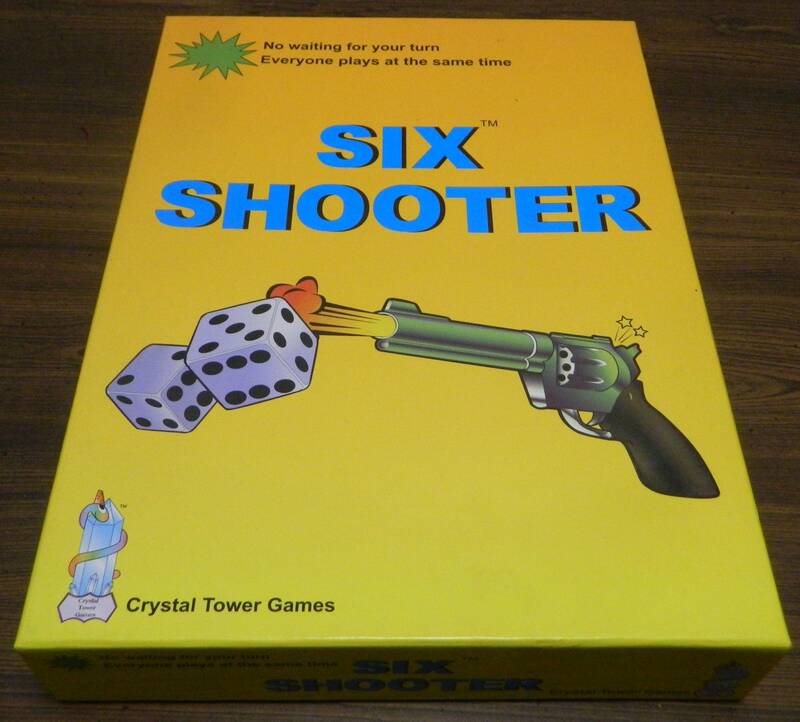 Six Shooter was never going to have a lot of strategy but being forced to roll certain combinations each round does limit your options in the game. Due to this reason I think Six Shooter is worse than Yahtzee and many other similar dice games. I honestly think you should just disregard the cards entirely and let players try to roll whichever combination they want. This would have added quite a bit more strategy to the game making it a much more satisfying experience. The component quality for Six Shooter is also quite bad. I think this has to do with the fact that Crystal Tower Games is a small publisher (they only made one other game). Unfortunately small publishers don’t have the same level of resources which leads to their component quality usually suffering. This is the case in Six Shooter. The dice are pretty generic even though I appreciate that the game comes with different colored dice. The gameboards are much worse. The gameboards are made of pretty thin cardboard but I appreciate that they utilize dry erase markers The biggest problem with the boards is that they are so bland. I am not expecting a lot from a small publisher and yet Six Shooter could have put a little more effort into the gameboard’s design. Should You Buy Six Shooter? At the end of the day, Six Shooter is neither a terrible or good game. It is quite average. The combination of a dice game like Yahtzee with Bingo is an interesting idea that unfortunately doesn’t bring a lot to the game. You mostly just roll dice and try to get different dice combinations like pretty much every other dice game. This can occasionally be fun if you are looking for a simple game that you can play without putting much thought into what you are doing. It gets repetitive pretty quickly though. The game has a little strategy but relies mostly on die roll luck. The components also have some issues. Six Shooter is not a terrible game but it has quite a few issues as well. Basically your enjoyment of Six Shooter comes down to one question. Does the idea of combining Yahtzee with Bingo intrigue you? If that idea doesn’t interest you, Six Shooter won’t be for you. People who think that idea sounds interesting though should consider picking up Six Shooter if they can get a good deal on it. An interesting combination of Yahtzee and Bingo. Can be a fun simple game that you don't have to put a lot of thought into. The Bingo mechanics ultimately limit some of the strategy in the game.